(Nanowerk News) Researchers have harnessed the latest nanofabrication techniques to create bug-shaped robots that are wirelessly powered, able to walk, able to survive harsh environments and tiny enough to be injected through an ordinary hypodermic needle. “When I was a kid, I remember looking in a microscope, and seeing all this crazy stuff going on. Now we’re building stuff that's active at that size. We don't just have to watch this world. You can actually play in it,” said Marc Miskin, who developed the nanofabrication techniques with his colleagues professors Itai Cohen and Paul McEuen and researcher Alejandro Cortese at Cornell University while Miskin was a postdoc in the laboratory for atomic and solid state physics there. In January, he became an assistant professor of electrical and systems engineering at the University of Pennsylvania. Miskin will present his microscopic robot research ("Fabricating Autonomous Machines for the Cellular Scale")on this week at the American Physical Society March Meeting in Boston. He will also participate in a press conference describing the work. Information for logging on to watch and ask questions remotely is included at the end of this news release. Over the course of the past several years, Miskin and research colleagues developed a multistep nanofabrication technique that turns a 4-inch specialized silicon wafer into a million microscopic robots in just weeks. 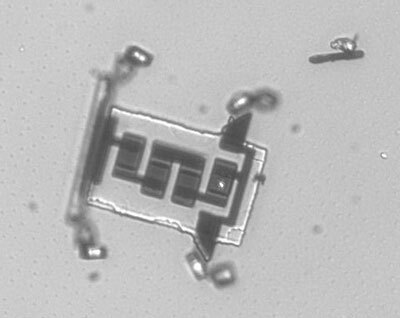 Each 70 micron long (about the width of a very thin human hair), the robots' bodies are formed from a superthin rectangular skeleton of glass topped with a thin layer of silicon into which the researchers etch its electronics control components and either two or four silicon solar cells -- the rudimentary equivalent of a brain and organs. “We found out you can inject them using a syringe and they survive -- they’re still intact and functional -- which is pretty cool,” he said.